Want to make it a Valentine's Day your sweetheart will always remember? This February 14th, skip the crowded, overpriced restaurants and cook up some romance at home with our Valentine's Day dinner ideas for two. From flirty cocktails and classic dishes like steak and lobster, to an indulgent chocolate mousse, this menu gives you ideas from starters to dessert. The rest of the evening is up to you! 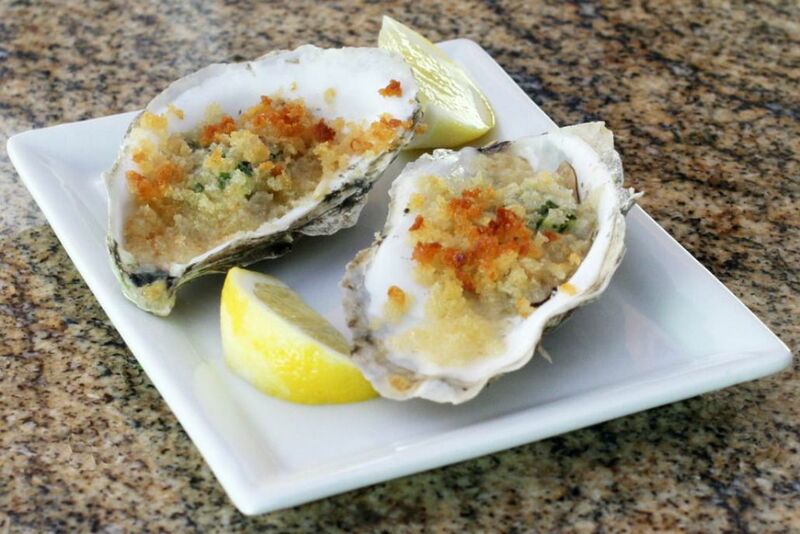 Start off the evening right with baked oysters flavored with a buttery herb crumb topping. Lemon juice adds zing, a little butter adds lushness, and panko breadcrumbs make the topping extra crunchy. Enjoy bruschetta nibbles with a bubbly cocktail before you sit down to your romantic dinner for two. Toasted baguette slices are topped with a flavorful fresh topping of diced tomatoes, basil, parsley, olive oil, and balsamic vinegar. Go ahead and skip the garlic if you prefer substituting some grated parmesan cheese instead. This smooth and luscious soup brimming with chunks of tender lobster meat is an elegant starter for your romantic dinner. It's surprisingly quick and easy to make in under 30 minutes with just a handful of ingredients. Decadent risotto infused with Amarone della Valpolicella—the prized red wine from Northern Italy—has a deep red color, and fantastic cheesy flavor. It makes an impressive first course or an attractive side dish to roast chicken or lobster. Sweet crisp fennel, creamy avocado, and red onions are coated in a simple vinaigrette to make this delicious side salad. The avocado melts a little to become part of the dressing, creating a rich forkful in every bite. Use a kitchen mandolin or a sharp cook's knife to thinly slice the fennel bulb. Are you a little bit nice and a little bit naughty? Serve up this unusual salad, featuring contradictory notes that balance each other beautifully. Belgian endive, sweet-tart bite kumquats, and refreshing mint mingle in a bright, lemony dressing. 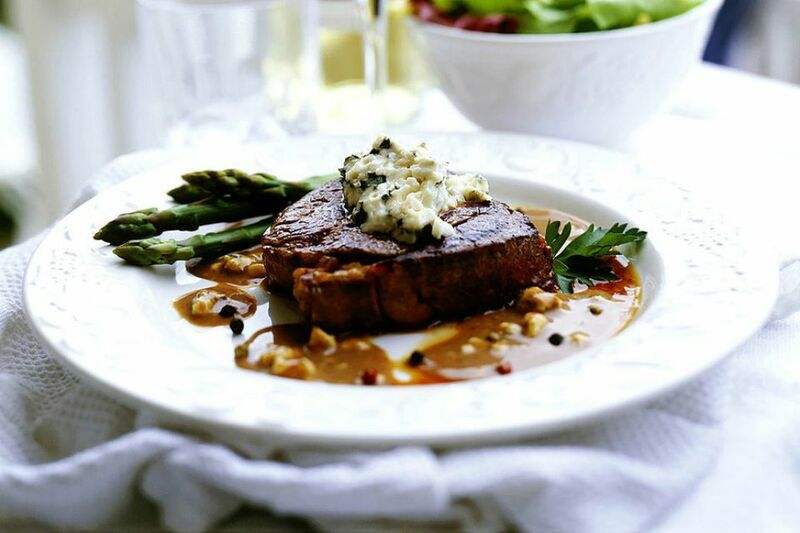 Seared beef tenderloin steaks are flavored with a creamy peppercorn bourbon sauce in this Valentine's Day entree. Make sure your oil is sizzling hot before adding the meat to the pan to achieve a great sear and use a digital food thermometer to measure perfect doneness to your taste. If you're trying to encourage a proposal, may we suggest this roast chicken dish? Delicious, crispy whole chicken gets its flavor from a gorgeous, salty-savory mixture of minced bacon and sage tucked under the bird's skin before cooking. Try adding a halved lemon to the cavity before roasting for even more flavor. Want a restaurant-worthy dish you can serve at home? Look no further than this showstopping stuffed lobster. A whole crustacean is split open and filled with a cheesy, crumbly cracker mixture that's baked to a beautiful golden brown. Serve with plenty of butter for dipping the tender seasoned lobster meat and you're set. Pasta alla puttanesca is a pasta dish with a scandalous origin story, making it worthy of enjoying on the night we celebrate love. Rich and complex in flavor, with the bold punch of olives, capers, anchovies, and tomatoes, it makes an enticing entree for enjoying with a glass of red wine. Buttery and crispy around the edges, chateau potatoes make a wonderful side for red meat or roasted poultry. Don't be fooled by the fancy French name—they're surprisingly simple to prepare. Just slice and sauté quickly in butter, then roast in the oven and finish with chopped parsley, salt, and pepper. This simple roasted veggie dish goes from fridge to table in less than 20 minutes, so it won't complicate your Valentine's dinner prep. A drizzle of balsamic vinegar, some good olive oil, Kosher salt, and cracked black pepper are all it takes to make oven-roasted asparagus sing. Creamy espresso creme brulee with just a hint of cinnamon and a caramelized sugar topping is out-of-this-world delicious. Make the individual ramekins a day in advance and use a kitchen torch (or your oven's broiler) to create the crackly sugar crust just before serving. What could be more romantic than feeding each other juicy chocolate-covered strawberries at the end of your Valentine's Day meal? This elegant dessert can be made earlier in the day and refrigerated, so there's nothing to do but enjoy them when you're ready. The Manhattan Love Story is a whiskey-based drink that adds Asian flavors to a traditional Manhattan cocktail. Dry sake, ginger liqueur, and bitters blend with New York whiskey for a boozy bite. Get a little flirtatious with this pineapple-flavored version of a sparkling Cosmopolitan. Mix it up just before serving so the Champagne doesn't lose its bubbles and serve in a martini glass garnished with a maraschino cherry. Lychee fruit is the star of this pretty red-colored cocktail that's easy to mix up and a pleasure to enjoy. Sweet fruit liqueur accents the tart, refreshing cranberry juice, while the vodka adds bite. Serve garnished with a sprig of mint or a cocktail skewer of fresh lychee.